Sarsen Technology is pleased to announce the release of the brand new XCalibur4402 from Extreme Engineering Solutions, Inc. (X-ES). The XCalibur4402 is a 6U CompactPCI, multiprocessing, single board computer (SBC) supporting the 3rd generation Intel® Core™ i7 processor. 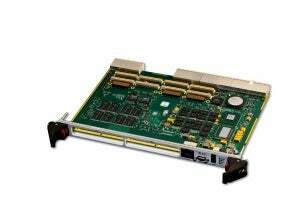 It is ideal for ruggedized systems requiring high bandwidth processing and low power consumption. The XCalibur4402 delivers enhanced performance and efficiency for today’s network information processing and embedded computing applications. The XCalibur4402 is a powerful, feature-rich solution for the next generation of compute-intensive embedded applications. It provides up to 16 GB of DDR3-1600 ECC SDRAM in two channels, two PrPMC/PrXMC slots, 32 MB of NOR flash, and up to 128 GB of NAND flash. The XCalibur4402 also supports Gigabit Ethernet, SATA, I²C, USB, PMC I/O, XMC I/O, and DisplayPort graphics out the connectors. Wind River VxWorks and Linux Board Support Packages (BSPs) are available, as well as Microsoft Windows drivers.